Ensuring literature will be celebrated and defended for years to come. Support PEN America with a Planned Gift. A bequest in your will or living trust: Bequests are a time-honored way of ensuring your support continues for generations to come. You can leave PEN America a percentage of your estate, a certain dollar amount, or specific assets. 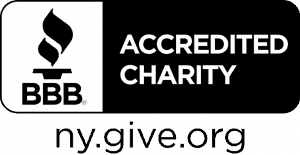 Charitable Remainder Trust: Provide for a beneficiary’s lifetime and then later to PEN America. Gifts of Intellectual Property, Royalties, and Residuals: Income from your literary works can help PEN America for years to come. CDs and other Bank Accounts: One of the simplest ways you can help ensure our future is by making PEN America the “transfer on death” beneficiary of a certificate of deposit (or any bank or brokerage account). Gift of Retirement Plan Assets: When left to family members/friends, retirement plan assets can be seriously depleted by taxes. However, when left to a tax-exempt charity like PEN America, your entire retirement plan gift will be available to protect freedom of expression well into the future. Gift of a Life Insurance Policy: Life insurance policies that have long since served their purpose make wonderful gifts. 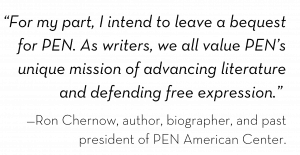 Please consider making PEN America a full, partial, or contingent beneficiary. Additionally, you can sign over a fully paid policy. Remainder of Donor Advised Funds: Final distribution of contributions remaining in a donor advised fund is governed by the contract you completed when you created your fund. Decide which asset you wish to donate to PEN America and in what percentage. Request a “change of beneficiary” form and add PEN America as a beneficiary. Fill in our legal name and tax identification number. Allows you to change your beneficiaries at any time. Enables you to provide for family/friends and PEN America. Requires no minimum contribution. Every gift makes a difference!